In this pertinent and valuable study O'Flaherty answers the crucial questions such as , what solutions did the Hindus offer to the problems of evil? How did these arise and develop historically? And, how if at all can these various solutions be subsumed under a unified world veiw? The problem of evil, in particular the question of theodicy, has long been overlooked or misunderstood by Indologists, who have maintained that there is no problem of evil in Indian thought, or that it was "solved" by the doctrine of transmigration and karma. Writers on Indian philosophy have touched upon the problem but no one has treated the extensive mythology of evil in Vedic and Puranic texts, which offer the full range of Indian approaches to the problem,. The intense emotional weight of the question of evil drove Hindus to generate literally hundreds of diverse and often contradictory alternative answers, presupposing but quickly transcending the logical yet unsatisfying "answer" offered by the doctrine of karma. The very bulk of these texts indicates the importance of the subject in Indian thought, and the failure to take into consideration some of the rather idiosyncratic Indian attitudes to this most basic problem has led to widespread misunderstanding of Indian religious thought in general. Dr. O'Flaherty marshals more than a thousand myths from the earliest levels of Indian thought (the Vedas) through contemporary tribal traditions, grouping and analysing them according to the "villain" in each plot-occasionally abstractions such as time, fate, or necessity, but more often anthropomorphic figures of gods, demons, or (rarely) men. 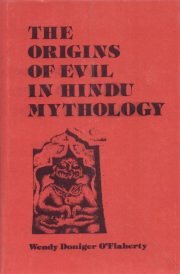 Many of these myths have previously escaped the notice of Indologists; many have never been translated before ; all are newly translated by the author and illuminated by mutual comparison-one myth explaining another-and through a hermeneutical approach which draws upon textual exegesis and a study of the ritual context of Indian religion. The Hindu's reluctance to blame demons or men for the origin of evil leads to a preponderance of myths in which demons are virtuous, while the gods-through inadequacy, malevolence, or (in later, devotional theology) a cynical benevolence- remove their own evil and thrust it upon mankind. A final attempt to resolve the conflict between good and evil within the individual is analysed in the light of psychoanalytical concepts of ambivalence, weaning ("the breast that feeds itself"), and splitting and integration. Wendy Doniger O'flaherty has the taught Indian religion at the school of oriental and African studies, University of London and the university of California , berkely.